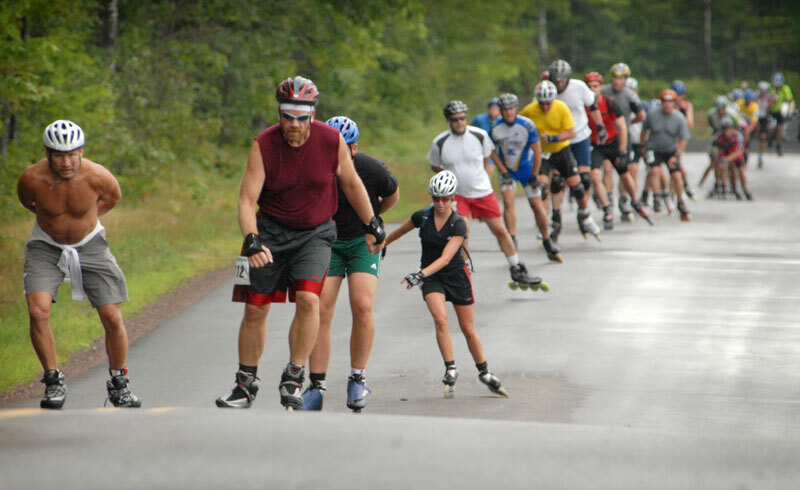 A Different Drummer - Fitness skaters form a long line on the first lap of the 13-mile Hayward road course. The odd man out is Scott Olson (far left), renowned for marching to his own drummer. Olson started the company that became Rollerblade (and launched the sport of inline skating) in 1979. After his ouster from Rollerblade, he became an inventor. His most successful invention has been the RowBike. On Sunday, the Minnesota native completed the 26-mile marathon in 1 hour, 41 minutes and 38 seconds.